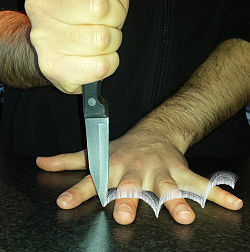 The knife game, pinfinger, nerve, bishop, stabscotch, stabberscotch, five finger fillet (FFF), or "stab between the fingers game", is a game wherein, placing the palm of one's hand down on a table with fingers apart, using a knife (such as a pocket or pen knife), or other sharp object, one attempts to stab back and forth between one's fingers, moving the object back and forth, trying to not hit one's fingers. The game is intentionally dangerous, exposing players to the risk of injury and scarring, and, before antibiotics, an incision or penetration risked sepsis and death. A foldable blade carries the additional danger that, "as the faster you go, the more likely the blade will fold back in on itself trapping the finger of your stabbing hand." It may be played much more safely by using another object, such as the eraser side of a pencil. In European culture it is traditionally considered a boys' game. However, its focus on motor coordination and dexterity is comparable to clapping games. Among our rowdy amusements [exiled in Siberia] was a popular knife game. You place the palm of your hand flat on a table with fingers apart. Then you stab back and forth between the fingers, trying not to hit them. The faster you stab, the better, and the fastest one wins. I still have a visible scar...as a reminder of this game. I don't know why we did such a dumb thing, but it seemed like the manly thing to do at the time. It was a macho thing to have a jacknife when I was young [in North Dakota] and even manlier to play dangerous games with it. One of our pocketknife games was...mumbly-peg....A more dangerous game was just called the Knife Game, also sometimes known as the FFF (five-finger fillets). This game challenged your coordination as you tried to stab a knife between your outstretched fingers while holding your palm down on the ground or on a table. Whoever could do that the fastest in an allotted time was the winner. The loser was the slowest—or the one who stabbed his hand or finger. I was the big loser one time,...it left an obvious scar...displaying validation of rituals confirming manhood. The order in which the spaces between the fingers are stabbed varies. In the following examples, the spaces are numbered 1 is in between the index finger and thumb. In Australia this order is used. In the Sierra On-Line game Manhunter: New York (1988), one sequence requires winning the knife game in a Brooklyn bar in order to continue the winning plot. In the Lucas Arts game Full Throttle (1995), the knife game is played in a bar. One of the minigames in Work Time Fun (2005). It has no win condition, so the game only ends once you hit a finger. Knife.Hand.Chop.Bot (2007), by the Svoltcore group, is an "interactive installation that plays with the recipient's concern about [his or her] own physical integrity." 2010's Red Dead Redemption, its prequel Red Dead Redemption 2 (2018) and 2011's Rage include the knife game as a playable mini-game. In The Witcher 3: Wild Hunt (2015), a few drunken locals can be seen playing the knife game inside an inn. In Call of Duty: WWII (2017), Robert Zussman is seen playing the knife game in an opening cinematic. In Danganronpa V3: Killing Harmony (2018) Kokichi Ouma attempts to play it in his final free-time again (but ends up cutting himself). On August 31, 2011, a YouTube video entitled "The Knife Game Song" created by songwriter Rusty Cage was released. Several internet users uploaded videos of them singing a song while playing the knife game. A new version of the song with additional lyrics was later released on March 29, 2013. In 2017, Rusty Cage released a video detailing his side of the story on the knife game. He uploaded his final knife game song on March 8, 2018. In January 2019, Rusty privated these songs from his YouTube due to fears of his channel being striked and terminated, however there are still re-uploads of the songs by other users on the site, and Rusty created a BitChute account so he could store his Knife Game videos. Roman Polanski's first feature Knife in the Water (1962) may be the first film to show the game; a young hitchhiker plays the game on the deck of a sailboat. The movie Aliens (1986) features a scene with a member of the crew, Bishop, who plays the "knife game" with another member of the crew. He accidentally nicks himself, but doesn't bleed blood, thus alerting Ripley (Weaver) that he is an android. The game is played in the movie Ted (2012) created by Seth MacFarlane; the eponymous character, the talking teddy bear, Ted, plays the game at a party with a stranger while intoxicated. He ends ups accidentally stabbing his hand. In The Hangover Part II (2011) an unsuccessful attempt at the knife game is eventually revealed to be the cause of the severed finger discovered in the motel room, which turns out to be an essential clue. In episode 8 of the first season of Samurai Jack (2001), some patrons of the bar in the opening scene is shown to play a version of the game with a spork instead of a knife. In episode 2 of The IT Crowd (2006), Moss can be seen playing the game as a fire spreads across the office. In Season 5, Episode 14 of The Amazing World of Gumball (2017), Darwin can be seen playing the knife game using a fork. In Season 1, Episode 2 of SuperMansion (2015), Black Saturn, Jewbot, Brad, American Ranger, and Cooch take turns failing at the game in the kitchen (with Cooch shoving the knife directly in to her thigh). In season 1, episode 6 of the HBO series Boardwalk Empire (2010) features a young WWI veteran, Jimmy Darmody, playing "Five Finger Fillet," and requesting the young Al Capone to join in. In episode 21 of the 11th season of The Simpsons, Homer Simpson can be seen failing the knife game and stabbing all of his fingers. In the episode "The Bill" of Inside No. 9, the knife game (called Stabscotch) is used to decide who should pay a restaurant bill. In The Night Of, the knife game becomes a pivotal element to the criminal trial. ^ a b Wilson, Richard (2013). Those Were the Days ... My Arse! : 101 Old Fashioned Activities NOT to Do With Your Kids, unpaginated. Pavilion. ISBN 9781909396319. ^ a b c d Webb, Simon (2011). 1960s East End Childhood, unpaginated. History. ISBN 9780752478395. "I cannot recall any of these games which did not ultimately end in bloodshed." ^ a b Armonas, John E. and Ruksenas, A. (2013). How I Became A Comrade: An American Growing Up In Siberian Exile, unpaginated. BookBaby. ISBN 9780983233084. ^ a b Hicks, Herb (2013). To and from Gigs: Challenges, Choices, Chances, Changes, p.3. iUniverse. ISBN 978-1-4759-9864-1. ^ "Computer Game Violence", STart (magazine), September 1989. ^ Kwastek, Katja (2013). Aesthetics of Interaction in Digital Art, p.86. ISBN 9780262019323. ^ "'Knife Song': Hanna Ellingseter, Norwegian Girl, Sings The Most Dangerous Song Ever (VIDEO [removed])". Huffington Post. March 4, 2013. Retrieved April 11, 2013. ^ Yetta Gibson (March 6, 2013). "Dangerous Internet trend: 'Knife Game Song'". AZ Family. Archived from the original on April 17, 2013. Retrieved April 11, 2013. ^ Rusty Cage (March 29, 2013). The NEW Knife Game Song!. YouTube.com. ^ Rusty Cage (April 8, 2017). The FULL STORY behind EVERY Knife Game Song. YouTube.com. ^ Rusty Cage (April 29, 2017). The FINAL Knife Game Song. YouTube.com. ^ Heller, Dana Alice; ed. (1997). Cross-Purposes, p.102. Indiana University. ISBN 9780253210845. One of, "the film's fears," is, "penetration." "Bishop's...knife game with the boys in the mess room evokes obvious s/m parallels." ^ "Boardwalk Empire". HBO. Retrieved 5 July 2018. This page was last edited on 15 April 2019, at 06:53 (UTC).